When thinking about how to build your internet marketing strategy around customer experience, you need to think like your customers so you can better meet – or even anticipate – their interests and needs. This will allow you to adapt your business and grow it with changing markets. That sounds logical enough, right? 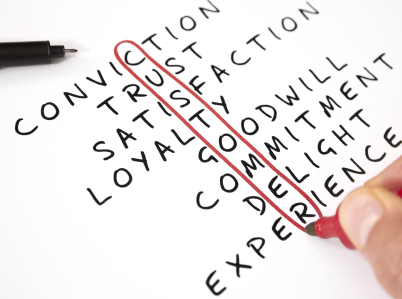 But what is customer experience really, and how do you incorporate it into a marketing plan? Think of “customer experience” as a way to describe the feeling a customer has for the combined effect of all of their interactions with a business. From the time they first discover your brand, through the purchase process, and if you are successful, to the point where they become an advocate for your brand. There are many pieces to the puzzle, so how exactly do you build all this into your Calgary marketing strategy? There are three concepts to remember: keep content meaningful, unify your message across channels, and evolve your plan over time, so it develops with your customers’ changing needs. Unlike other marketing channels, you don’t need to bring your customers to social media – they are already there! And, they are likely already discussing your brand. In order for you to improve customer experience, you need to find these conversations, listen to what they are saying, and adapt your content to fit what interests your customers most. Once your customers are following you on Facebook or Twitter, or any of the social media services, chances are good you will soon have them reading your blog or email communications. You can facilitate this by including share and follow buttons in all of your marketing channels. Don’t make your customers come looking for your content. Make it easy for them to find, follow and share. Finally, to continue improving customer experience in social media, you should monitor the effectiveness of your social media efforts. Track which content or which social networks are driving traffic and generating leads, so you can evolve your Calgary marketing plan most effectively. The old days of a company website being essentially a brochure for your business are long gone. Your website unifies all of your company’s sales, marketing and support methods, and absolutely must present a customer, whether they are a lead or a brand advocate, with easy access to the information they are seeking. To be able to do this most effectively, your company needs to pay acute attention to your web analytics data. Specifically, you need to know how often customers visit, the most popular pages, and previous conversions. Learn how and when a customer got to your website, including search terms, and the time of day. Knowledge of your customers’ participation on social networks is also key. Once you have all this information, you can tailor your website to meet your customers’ needs more effectively. Be consistent and unify your efforts across all your marketing channels. Your website should reflect what is happening in your social networks just as much as in your marketing emails. Your Calgary marketing plan should also reflect a commitment to evolve your website through what your analytics tell you about customer experience. Many websites say they are mobile friendly, but to really deliver the best customer experience, you need to optimize your website and email marketing for the mobile devices your customers use most often. To really create a meaningful mobile experience, your highest priority content needs to be easily accessible on devices with smaller sized screens. Your goal is to create a unified experience. Whether on a mobile device or a desktop, customers need to always know they are on your website. Don’t make your mobile design experimental or radically different, and do extensive testing to make sure it works well. Evolve your mobile design with A/B testing to determine what creates the best customer experience. Mobile marketing is new territory, and design best practices are not clearly defined, so you need to be flexible and able to adapt to your customers need quickly and fluidly. When considering how to put customer experience at the heart of your Calgary marketing plan, you need to take the time and do the research on your customers. Think about how to provide them with the most meaningful content unified across all channels of communication, and use all the tools you have at your command to evolve it to meet your customers developing needs.